IMHO I’m not good in SEO or Search Engine Optimization but I try to learn the basic dos and don’ts of it. Why and who cares? If you are serious about Blogging or Online Publishing, of course you desire to reach people, attain your goals and spread your messages. Indeed, if you are blogger whether you accept it or not you have certain power – small or big. Last Saturday I’m part of SEO Lead Generation Conference facilitated by Janette Toral of eCommerce Bootcamp and Digital Filipino. Though I was only convinced to attend, talagang nagpa-convince naman ako because it’s free and had interesting topics that I need to know. I saw familiar faces sa conference like Genesis Reonico of OnlineJobs University (speaker of Building and Sustaining a Lead Generation Community) and Fitz Villafuerte of 199jobs and Ready to Be Rich ( speaker of Buyer Persona Creation for Lead Generation). 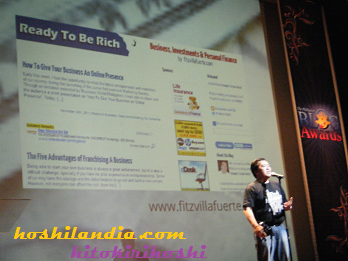 Aminado ako na avid reader ako ng blog ni Fitz and isa siya sa peg ko sa aking quest sa serial entrepreneurship. Listening to their talks boost my freelancing and entrepreneurial sprit. what is the problem that they want to solve? which led them to your business? what are the things they value the most? Parang Math ang presentation ni Marc Acsay kaya medyo alangan akong intindihin ( medyo hate ko kasi ang Geometry and Trigonometry) pero naiparating naman niya ang mensahe ng kalahalagahan ng unique selling preposition na dapat kong matutuhan. Siempre marami pa akong notes na nakuha mula sa conference na aking pag-aaralan at ibabahagi sa mga susunod na post. Sa ngayon, nais kong magpakilala na Hoshi the blogger and going to be Search Engine Influencer. Mabuhay!